Melancholy of Haruhi Suzumiya is a supernatural light novel series by Nagaru Tanigawa with several anime adaptations by Kyoto Animation. Haruhi Suzumiya is the name for a series of light novels written by Nagaru Tanigawa, with illustrations by Noizi Ito. The first was The Melancholy of Haruhi Suzumiya (Suzumiya Haruhi no Yuuutsu). The protagonist of the series is Kyon - a skeptical and somewhat cynical high school student. 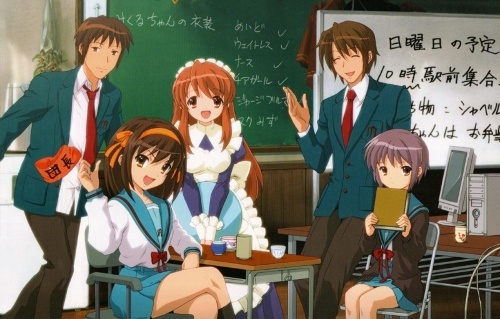 The story centers on the events happening around Haruhi Suzumiya - an eccentric girl fond of the supernatural, including aliens, espers, and time travellers - who Kyon meets at the beginning of high school. The light novels have been adopted into anime series, four manga series, an animated film, two original net animation series, and a number of video games. What was the deal with Haruhi's Endless Eight?